- Ronald Duncan, 'A Visit to Mr and Mrs Lewis', 4-7. - Michael Nath, 'Telling History the Time', Review of Paul Edwards, Wyndham Lewis: Painter and Writer (2000), 8-14. 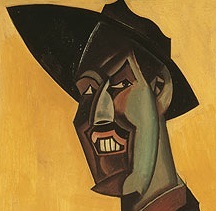 - Min Wild, 'Nietzsche's Man, or Some Sort of Magician', Review of Paul O'Keeffe, Some Sort of Genius: A Life of Wyndham Lewis (2000), 15-19. - Michael E. Leveridge, 'The Printing of BLAST', 20-31. - Dennis Brown, 'James Joyce's Fable of the Ondt and the Gracehoper: "Othering", Critical Leader-Worship, and Scapegoating', 32-42. - Peter L. Caracciolo, 'Wyndham Lewis, M. R. James, and Intertextuality Part II: Canons and the Uncanny', 43-54. - Graham Lane, 'Bibliographical Notes for 1977', 55-61. - Alan Munton, 'Sottisier', 62-3.